Synopsis: A young, countryside, ribbon dancer moves to the big city and befriends a local hip-hop dancer. While preparing for the big competition, life and love get in the way of the crew's hopes of winning. When one describes a film as a "dance movie", the stereotypical premise pops into mind of a dancer or crew trying to make it big, defeat the reigning dancers, and find one's self. 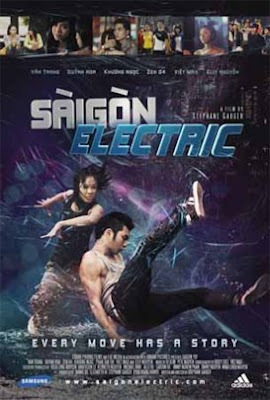 SAIGON ELECTRIC has many of the same plot points as the typical dance movie, yet strives to reach beyond the big competition and create real characters. Mai has come to Saigon to try out for the national dance academy. She's a traditional ribbon dancer, but she doesn't fit in well with the Saigon dance scene. She befriends a local hip-hop dancer, Kim, who dances with Saigon Fresh. Kim's crew is preparing for the Saigon championships and hoping to take down the other local crew North Killaz. While preparing for the big showdown, outside forces begin to get in their way. A rich boy becomes infatuated with Kim, and he eventually convinces her to go on a date. Her feelings become mutual, and because of their relationship, Kim focuses less and less on dancing. Then, there's the side plot of a big bad business wanting to shut down the dance center where our crew practices and runs after school programs for kids. There's also a side story about Kim reaching out to her grumpy old landlord. All these plots have the makings of a great movie, but because they're trying to say so much with such little time, none are given ample time to develop. Also, as weird as it is, this movie lacked dancing. There were a couple of fun sequences, including the final showdown; however, I found myself forgetting this movie was about dance. The tension of beating the North Killaz crew was lost in the shuffle of the various subplots. The main characters of Mai and Kim are well acted and have some poignant moments. These aren't your typical American dance movie actresses who dance but cannot act themselves out of a paper bag. These are actresses who can also dance. Their friendship is genuine and nothing seems forced. Overall, the potential was there for this movie, but the script tried to hit too many plot points without fully developing each story.